Bedbugs seemed to be everywhere. They were found in the Empire State Building in August, 2010. A patient at NYU's Hospital for Joint Disease reported seeing one there on Dec. 1, 2010, causing the hospital's partial evacuation, but it was a false alarm. MANHATTAN — Bed bugs, be warned. The city rolled out a new set of weapons in its war against the blood-sucking critters Tuesday, including stricter rules for landlords responding to tenant complaints. "Today New York City is biting back," said City Council Speaker Christine Quinn, who said the new campaign is intended to fill an information gap for residents and building owners who often don't know how to identify or get rid of the pests. Under the Department of Housing Preservation and Development's new guidelines, landlords whose tenants register bed bug complaints will be instructed to hire qualified pest management professionals to treat the infestations. 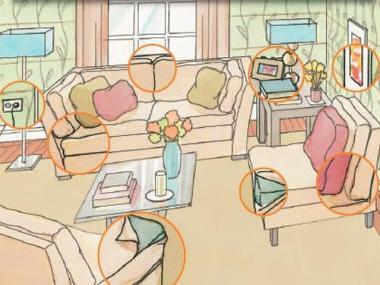 The new site contains information about how to identify and get rid of bed bugs. Instead of just treating the apartment where a tenant has complained, the owners will now also have to inspect and treat apartments next to, below and above the infested unit. Landlords who persistently fail to comply with the rules will now be required to notify tenants that bugs have been found in their buildings and distribute plans for treating them, officials said. Owners may also be forced to appear at Environmental Control Board hearings, where they may face violation fines for refusing to comply. To help scout out the pests, HPD has also received permission to hire two new bed bug-sniffing dogs. Deputy Commissioner Vito Mustaciuolo said the dogs should be joining the department's inspection staff, which is also being re-trained in bed bug detection, within the next few months. 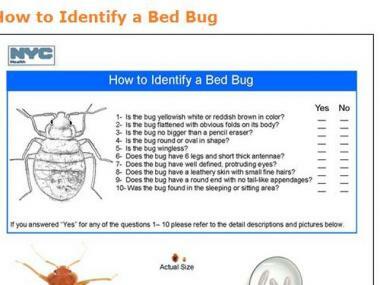 As part of the ramped-up efforts, the Department of Health also unveiled a new web site with information about how to prevent, identify and get rid of bed bugs, including numerous photos and a narrated, animated introduction to the pest. "We're going to turn all of New York City into amateur entomologists," DOH Deputy Commissioner Daniel Kass said. A section on advice for travelers advises using hard-cased luggage instead of soft, packing clothes in resealable plastic bags, and packing a small, bright flashlight to inspect your room when you arrive. Returning travelers are advised to unpack in their bathrooms against light-colored surfaces and then wash clothes immediately. Quinn said she hoped that having all of the information in one place would encourage people to become informed. "Now, instead of having people trolling the Internet confused and afraid, they simple can go to nyc.gov/bedbugs," she said. 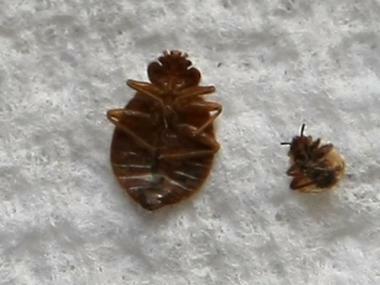 The new site includes information about where bed bugs commonly hide. The new rules come after reported infestations everywhere from movie theatres to hotels to the Empire State Building. The HDP received 12,768 complaints about bed bugs in 2010 and issued 4,808 violations, Mustaciuolo said. A new law passed last summer also forces landlords to tell prospective renters or buyers whether the apartment they are looking at, or any others in the building, have been infested within the past year.